My bows are made from several woods. When you contact me we can discuss the materials, details, and the price with you. But my bows for the very young begin at $35. I am also thinking of making some miniature bows, and maybe even some tiny tomahawks, adzes, and other primitive tools. Call for details and prices. I try to reply promply to every inquiry I receive, but every once in a while, an e-mail gets lost. If you e-mail me and do not receive a reply within 24 hours, please phone me. 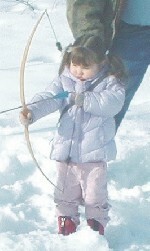 The purchaser assumes ALL responsibility for the proper, and improper, use of the bow - by the child or anyone else. Sunrise Lumber Larry Larmon cuts some very beautiful specialty lumber. Email him for details, or phone him at 360 864-8624 (mill) 360 748-1757 (home). This new site is in the process of being improved.